165 years ago, Edgar Allen Poe was on his way from Boston to Virgina, preparing for a new job. He never made it and was found on a bench in Baltimore, near death. He was delusional, wearing someone elses cloths, and kept repeating the name Reynolds, before he died. To this day, the cause of death and his reason for being in Baltimore are unknown. On the anniversary of his death, I decided to watch The Raven, which contrary to popular belief, is not a remake of an older film. This story is a fictional take on Poe's last days, as the writers have Poe assisting local police in catching a serial killer. A killer is on the loose in Baltimore and using Poe's stories as the inspiration for his crimes, so who else is more qualified to help catch him than Poe? I am not a big fan of period dramas, as most are historically inaccurate and move at a snails pace, but the Raven was different. As fiction, it is of course extremely inaccurate and features Poe as an eccentric has been and a fall down drunk, but surprisingly the film is fast paced and really keeps you on the edge of your seat. The idea of using Poe's stories as the inspiration for a real murderer, who tries to copy his stories to the last detail was really brilliant and it plays very well, especially to fans of his work. John Cusack plays the mysterious writer and by this point in his career, I'm convinced that the man can play anyone and be believable. In thirty years, there isn't a role he wouldn't take on and I'm hard pressed to remember even one instance of him failing to be spectacular. 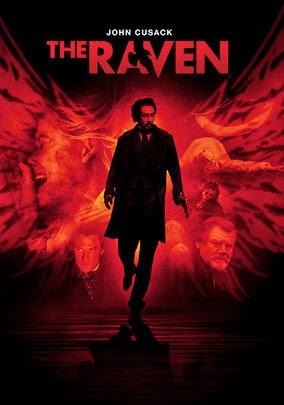 The Raven is a stand alone film, with a common title for films featuring Poe, however this one is a great mystery that incorporates very little modern day thinking into the story. The Raven has everything you'd expect from this type of film, simply set 165 years ago. From police chases on horse back to wild 1800's costume parties, this film really surprised me with just how good it was and most definitely gets labeled as a must see movie!